So, you know you've got to kill a load of monsters and find a way out of here, but how exactly do you do that? And survive the journey? All is revealed! When you start out the dungeon is mostly covered by a black shroud. You can only see the squares directly next to you. To move: tap onto an empty uncovered square. To scroll the map: tap and hold then drag the map. You can't move directly onto a covered square. Move onto an uncovered square nearby to reveal more of the map. To change your mind: If you tap, hold down your finger and drag slowly. Move the blue selection to where you really want to go. Green background: Instant powerups. These are activated on pick up and typically last a limited number of hits. See the effect in the ability bar. To get help on an item, ability or monster: Tap and hold on the icon you're interested in. On-line help should pop up. Tap the online help window when done to dismiss. Fighting is a fact of life in Dungeon Ascendance. Here's how to do it! To target a monster: Move to an empty square next to the monster. The monster will be targetted (red outline) and the monster stats appear in the bottom / right panel. If you happen to be in a square adjacent to two or more monsters, a different monster might be targetted. If so, just tap the monster you want to attack, and its stats will appear in the bottom / right panel. To attack a monster (melee): When a monster is targetted (stats in the bottom / right panel), tap once more to carry out a melee attack. Watch out - monsters fight back in melee! To attack a monster (ranged): When a monster is targetted, tap on the ranged ability you want to use in your ability bar. You'll see an attack effect appear on the monster. Monsters don't fight back in ranged attacks. 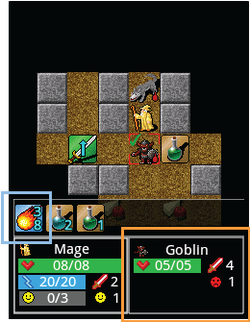 The goblin surrounded by the red square is targetted. Tap again to attack! The orange square highlights the goblin's statistics. 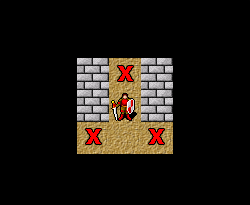 The blue square shows a ranged attack ability. Tap it to carry out a ranged attack! To beat a dungeon: Find and defeat the Dungeon Master! You can then escape via the stairs. To really beat a dungeon: After defeating the DM, stick around and kill everything else! Then escape as the true master of the dungeon!